The Partnership Framework 1 is now established as the EU approach to address the challenge of irregular migration and its root causes as part of the broader cooperation with third countries. 2 The European Council has been tracking progress and at its last meeting in December 2016, called upon Member States to continue and step up engagement so as to progress on "stemming the flows and improving return rates" 3 . This Third Progress Report presents the progress made since December. Engagement with the five priority countries identified in the June Communication has continued to develop. In line with the European Council Conclusions of December, this report will also look beyond the five priority countries. In particular, the report reflects the current focus on the Central Mediterranean route 4 responding to the continued high number of crossings on this route, and the unacceptable level of deaths in the Mediterranean. A dedicated section of the Report sets out the first steps taken to implement the actions agreed in the Malta Declaration adopted by the Heads of State or Government at the informal Summit in Malta on 3 February, notably measures to save lives, step up the fight against smugglers and traffickers, protect migrants and improve migration and border management, in close cooperation with North African countries, and in particular with Libya. Given the close link between the Partnership Framework and the work to take forward the Valletta Declaration and Joint Valletta Action Plan 5 , the Report takes into account the results of the senior officials meeting in February 6 . The Partnership Framework is part of the comprehensive response to the migration challenge set out in the European Agenda on Migration, where every strand of action is intertwined. In this perspective, this Report is linked to the renewed Action Plan on a more effective return policy and the Recommendation on the implementation of the Return Directive adopted in parallel by the Commission 7 . Substantial progress on returns also depends on making legal and administrative processes inside the EU simpler and more effective, and also on ensuring full cooperation with third countries of origin, fully respecting humanitarian imperatives and a high protection of human rights. With the Partnership Framework approach in place and with concrete objectives and actions identified and under way, the task now is to increase tangible results in all areas of cooperation. Progress in reducing flows and increasing returns needs to be stepped up in view of the upcoming summer season. Work needs to intensify to build a common understanding between the EU and partner countries of the issues at stake and how to address them, to carry this forward into concrete results, and to strengthen further the good cooperation between the EU and the Member States. The Commission, in close cooperation with the European External Action Service, will take stock of the approach and its results in reducing irregular migration flows, addressing its root causes and improving return rates when it reports in June, one year on from the launch of the Partnership Framework. Cooperation with Niger as a key transit country continues to be effective. The visit of President Issoufou of Niger to Brussels in December 2016 gave an opportunity to underline the importance of EU-Niger relations and the mutual interest in fighting smuggling and ensuring better migration management in the Sahel region. The Danish Minister for Development Cooperation visited the country in January, in parallel with an EU technical mission. A further technical mission in February gathered data on alternative routes and identified options for possible new projects. An EU and Member State senior official mission to Niger is planned for the end of March. There has been a clear decline in departures of migrants from Agadez towards Europe (from the peak of 70 000 departures in May to 6 524 in January 2017) 8 . The number of migrants being directed towards the International Organisation for Migration for repatriation has increased, together with voluntary returns. In 2016, the number of migrants supported in centres operated by the International Organisation for Migration doubled over the previous year, with over 15 000 assisted 9 . Out of these, 4 788 migrants from third countries and 301 Nigeriens were assisted with voluntary return to their communities of origin during the first eleven months of 2016 (more than three times the figure for 2015). The transit centres have also offered training to both migrants and the local population to develop sources of income in areas like brick-making and the production of jewellery. By the end of 2016, over 600 people had benefitted from this training. The Nigerien law enforcement authorities have continued their efforts to address irregular transit and smuggling of migrants, with more vehicles seized and drivers arrested. EU funds are supporting enforcement of the anti-migrant smuggling legislation. More efforts are certainly needed to effectively dismantle smuggling networks, which often work across borders. Work will focus on strengthening the EU support for the implementation of the Nigerien emergency Action Plan against smuggling of migrants in the Agadez region, adopted in November. Key to this is the reinforcement of EU and Member State presence in the field. Action against smuggling networks will also be reinforced by support to a joint investigation team. An EU Migration Liaison Officer was deployed to the EU Delegation in Niamey on 1 February. Further EU staff, including a European Border and Coast Guard Agency liaison Officer, will also be deployed to the Delegation. Through the Africa-Frontex Intelligence Community, national authorities of the partner countries along the migratory route are supported to develop risk analysis and assessment of flows. A meeting of the Africa-Frontex Intelligence Community is taking place in Niger at the start of March, and a Risk Analysis Cell will be launched later in 2017. In addition to the emergency Action Plan, a medium term Action Plan, under preparation by the Nigerien authorities, will aim to address gaps in the current approach. Both will be taken forward under a new national strategy on migration which is currently being finalised by the Nigerien authorities. EU action also supports Niger's overall development efforts and the root causes of migration and forced displacement. In addition to a budget support programme, Niger is now benefitting from nine projects supported under the EU Trust Fund for Africa 10 . At the end of January 2017, three new projects were launched on the ground in Agadez. In addition, further projects were approved in December, which are expected to include assistance to 30 000 migrants, return of 12 000 persons and the sensitisation 11 of 40 000 migrants. The projects also target providing a plot of land, accommodation and access to drinkable water to 28 000 people, while 42 000 people will have access to accommodation and drinkable water, and 2 000 construction jobs will be created. The Commission has also signed a contract with the High Authority for Consolidation for Peace that will provide short term employment opportunities for youth, thus contributing to provide alternative sources of income for 65 000 people. Other projects being developed include assessing the feasibility of a project of a hybrid power plant in Agadez, which would be an important factor for boosting both employment and energy security. A project under the EU Trust Fund for Africa has already been approved in the Diffa region, which faces particular pressures following the Boko Haram insurgency. Security issues are however hampering the efficiency of aid delivery. While a decrease of flows through Agadez has been observed over the recent months and the Nigerien authorities have stepped up control of the known main transit routes, potential alternative routes will need to be monitored, both within Niger and through neighbouring countries (such as Mali, Chad or Algeria). These alternative routes are likely to be more dangerous for migrants, given the geography, the poor infrastructure, and the presence of armed groups. In January 2017, the EU conducted two field missions to assess these routes and to help identify rapid impact projects to create economic alternatives in local communities reliant on the income from smuggling. Effective monitoring and analysis of alternative routes requires working jointly with the International Organisation for Migration and European and Member State liaison officers. In addition, synergies need to be developed with the projects in areas like police cooperation and existing regional cooperation, as well as strengthening cooperation in other other policy areas such as climate change (soil rehabilitation, irrigation, reforestation) and education mobility. Addressing developments on the route requires stronger regional engagement, in particular with the G5 Sahel 12 . The EU already provides support, mainly through its Common Security and Defence Policy missions and the EU Trust Fund for Africa. The EU will continue increasing its support to the G5 Sahel. Furthermore, new activities could be considered, to enhance the capacity of Libya's southern neighbours in areas such as border control and intelligence. Swift signing of contracts on all actions now agreed under the EU Trust Fund to ensure concrete implementation and provide alternative income opportunities to substitute the smuggling economy. Intensified action to fight smuggling and trafficking, including support to a joint investigation team. Intensified monitoring of possible alternative routes and preparation of support to appropriate action in response, modelled on the approach taken in the Agadez region. Provide feedback to a medium term Action Plan developed by Niger, expected by the end of March, focusing on gaps to be addressed. Establishment of a working arrangement between the European Border and Coast Guard Agency and Nigerien authorities and deployment of a liaison officer to the EU Delegation. Full operationalisation of the EU antenna in Agadez, including for training. Follow-up on the meeting of the Africa-Frontex Intelligence Community and prepare to launch the Risk Analysis Cell. Nigeria is Africa’s most populated country and Nigerians constitute the largest single group of irregular migrants to the EU, with 37 811 detected crossings in 2016 13 . The economic and security situation is a major push factor for migration movements, both within the region and towards the EU. In line with the objective of broadening the policy areas of cooperation with Nigeria, Commission Vice-President Ansip visited the country on 2-3 February, where he met with Vice-President (and then acting President) Osinbajo to discuss areas of cooperation relevant also for migration management. The visit explored possibilities to launch pilot projects and cooperation in areas including e-Government, cyber security, fighting corruption, promotion of investment and trade, as well as migration management. Furthermore, high-level contacts have recently taken place with the Netherlands and Spain, whilst Nigeria and Italy are discussing technical assistance, to possibly include developments on biometric databases. Nigeria remains the most significant country of origin for non-EU victims of trafficking in the EU. 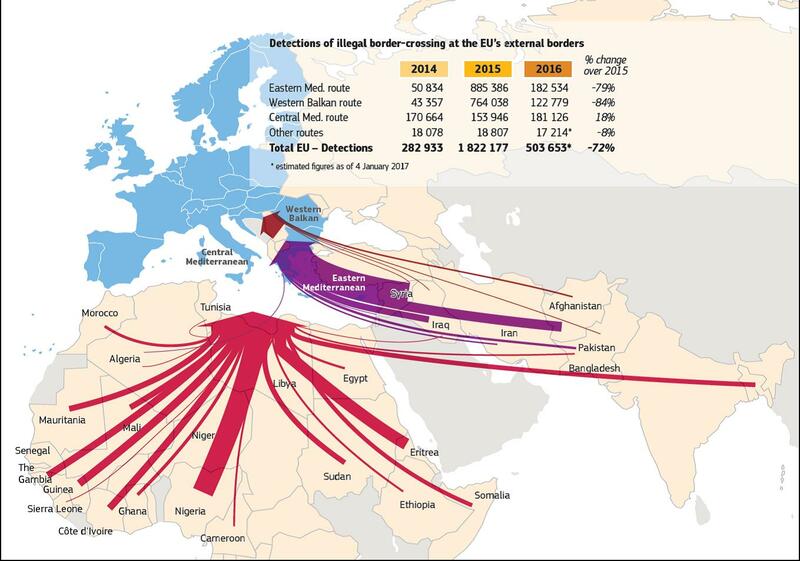 Nigerian traffickers are the most reported traffickers in the EU from non-EU countries 14 . To help tackle this, Nigeria actively participates also in the Africa-Frontex Intelligence Community, and the recently launched Cooperation Platform on Migrant Smuggling, involving EU Agencies and Member States, will help to improve cooperation and coordination on the fight against smuggling and trafficking. The framework of the EU-Nigeria cooperation on migration is structured under the Common Agenda on Migration and Mobility, signed in 2015. In terms of return and readmission, Nigeria cooperates with a number of Member States but cooperation is uneven. In 2015 28% of return decisions resulted in effective return. Based on data available so far, the return rate seems to have improved in 2016. The level of cooperation on readmission varies across the EU. In 2016, Nigeria was the main destination of European Border and Coast Guard Agency joint return operations and the cooperation is relatively positive – Nigeria responded positively to around 60% of the requests for travel documents. However, Nigerian identification missions to three European countries in November 2016 have not yet yielded the expected results: three months later, emergency travel documents for the identified migrants are still to be issued by the Ministry of Foreign Affairs. Progress in the negotiations of the EU-Nigeria readmission agreement is of the utmost importance: the first round took place in October 2016, but a second round of talks has been postponed several times by Nigeria. The EU's aim is to conclude the readmission agreement in time for the planned EU-Nigeria ministerial meeting. A European Migration Liaison Officer has been deployed since 1 February. The EU Trust Fund for Africa is an important instrument for projects in Nigeria with a strong migration focus, particularly on the South of the country. It complements the sizable national contribution towards addressing root causes of irregular migration and forced displacement under the national envelope funded by the European Development Fund. Projects adopted under the EU Trust Fund for Africa in December 2016 with the International Organisation for Migration will lead to the reintegration of more than 3 800 returning migrants from EU and transit countries. In addition, more than 5 million pupils will benefit from books and literacy lessons, and more than 75 000 children will gain access to mental health services. Other areas to explore include Foreign Direct Investment (including through the proposed External Investment Plan – see section 4) and the digital economy, areas of interest to Nigeria that would have a direct impact on the root causes of migration. The Commission also continues to cover basic humanitarian needs of the victims of the crisis in Nigeria. In seven years of conflict in North-eastern Nigeria, over 20 000 people have been killed and 1.77 million internally displaced. This includes mainly assistance in terms of food and nutrition, protection, water, sanitation and hygiene, shelter, non-food items, and health. Conclude the negotiations on the Readmission Agreement by June 2017. Continue active cooperation on anti-smuggling and trafficking through the Africa-Frontex Intelligence Community and the recently launched Cooperation Platform on Migrant Smuggling. Identify EU Trust Fund for Africa projects with a strong migration focus. Senegal is a key political partner for the EU in the region and beyond. As well as being one of the central actors in the Rabat Process and the follow-up of the Valletta summit, cooperation also extends to areas like the International Criminal Court and the fight against radicalisation and terrorism. Senegal's priorities are legal migration, the fight against migrant smuggling and addressing the root causes of irregular migration. Engagement with Senegal on migration management has to take into account the political context: Senegalese diaspora will for the first time be able to directly elect members of the National Assembly in the legislative elections scheduled for July 2017. This will give a particular political importance to the interests of long-term Senegalese residents abroad. More broadly, it also reflects the economic, cultural and social significance of migration in Senegal: a support fund for investments financed by the Senegalese diaspora 15 is a tangible demonstration of how the diaspora can help to create employment opportunities in Senegal and thus contribute to provide domestic perspectives for young people. Taking into account these sensitivities, dialogue with Senegal at political level has continued, including a meeting between High Representative/Vice-President Mogherini and President Sall in Dakar in December 2016, and a visit of President Sall to France. Nevertheless, most Member States concerned by returns to Senegal continue to face difficulties when seeking cooperation on the identification and documentation of irregular migrants presumed to be Senegalese nationals, and a number of planned identification missions did not materialise. Even where migrants have been identified for return, it has proven challenging to obtain the travel documents required from the Senegalese authorities. In 2016, only 563 Senegalese irregularly staying in Europe returned to Senegal. This figure contrasts with the more than 10 000 Senegalese nationals that arrived irregularly through the Central Mediterranean route in 2016. Some progress has been made in bilateral work, focused on returning irregular migrants who recently arrived via the Central Mediterranean route. If these initial steps of cooperation deliver tangible results in the coming weeks, they will be further consolidated by way of exchanges of officials and trainings to be organised on a bilateral basis within the EU framework, including by supporting reintegration projects. Missions to other Member States are still expected to take place in 2017. On this basis, strands of cooperation, including on legal migration and mobility, will be further explored, starting with Erasmus+ opportunities. A European Migration Liaison Officer was deployed to the EU Delegation in Dakar on 1 February 2017. Senegal has also identified Focal Points for Identification in relevant ministries. Negotiations between the European Border and Coast Guard Agency and the Senegal authorities on improved working arrangements for closer cooperation have also been launched. In support of efforts to address the root causes of irregular migration, Senegal can benefit from nine projects supported under the EU Trust Fund for Africa, four of which were adopted in December 2016 16 . These new projects will support reintegration, job creation, and a biometric national registry system. The results from these new projects would include reintegration of 3 000 persons, and sensitisation of 200 communities and 30 000 migrants. It is expected that more than 6 500 new jobs will be created. Senegal also benefits from the regional project supporting the internal security services of six Sahel countries. This could be stepped up on the basis of the ongoing cooperation through dedicated engagement for example in the fields of fisheries, climate change, renewable energy, agriculture and education mobility. Follow up missions undertaken, ensuring the effective return of identified irregular migrants. Finalise and sign by mid-2017 working arrangements between Senegal and the European Border and Coast Guard Agency. On the basis of results achieved step up cooperation in other areas including border management. Mali remains a significant country of both origin and transit for migrants. 10 268 Malian nationals arrived irregulary to Italy through the Central Mediteranean route in 2016 17 . Dialogue and cooperation with Mali on return suffered a setback following inaccurate media reports in December 2016 about the signature of a formal agreement on return with the EU which never took place, and Mali did not sign Operating Procedures on readmission. The number of return decisions issued to Malian nationals in 2016 (3 302) remained at approximately the same level as in 2015 (3 505) 18 . But only a small proportion of these have been effectively returned (6.5 % in 2016). Difficulties persist as to the confirmation of nationality and the issuance of consular travel documents by Malian consulates to persons identified as Malian nationals. This dimension will need to be further addressed in the contacts with Malian authorities to find common ground and workable solutions. The role of the diaspora in Europe could be reinforced to assist areas like voluntary returns and reintegration of Malian irregular migrants in their local communities. On the positive side, engagement on the fight against smuggling of migrants continues, as does high level dialogue. Mali also continues to play a constructive role in the follow-up to the 2015 Valletta Summit, as chair of the Rabat Process and a recent meeting between High Representative/Vice-President Mogherini and Minister for Malians Abroad Sylla identified common priorities for further cooperation on migration management. The fight against migrant smuggling and human trafficking, and the reinforcement of Mali's border management, are priority areas for action in the short term. On border management, cooperation with the Malian authorities is already ongoing. In the past months, work has focused on cooperation with Malian actors and international partners to support a National Border Strategy and a related Action Plan. This should soon be adopted. In addition, capacity building of the police forces in charge of border management in Mali will continue in the months to come, in coordination with other regional initiatives on border management and organised crime. A Common Security and Defence Policy (CSDP) mission is already operating in Mali and its migration dimension will be stepped up in the coming months. Mali is one of the main recipients of funds through the EU Trust Fund for Africa, with nine projects approved so far 19 . The projects adopted in December 2016 are now in the contracting phase. They include projects to improve the biometric population registry, for the reintegration for returnees and for youth employment. Expected results would include the direct creation of 10 000 jobs and indirect creation of 35 000 jobs. 16 000 migrants will be assisted, 4 000 returned, and 1 900 reintegrated. In addition, 17 000 migrants will be sensitised. The other six projects approved earlier in 2016 are in the process of being implemented, including a support program for border management and for reinstallation of Malian security forces in sensitive regions. This comes on top of support under the European Development Fund and potential for further cooperation in areas such as agriculture, climate adaptation and education mobility. The situation in terms of protection is also a concern, with over 35 000 internally displaced persons inside Mali and almost 136 000 Malian refugees in its neighbouring countries 20 . Despite the worsening security environment in central and northern Mali, the Commission continues to work with humanitarian actors to deliver support to Malian communities in these areas, as well as in neighbouring countries hosting refugees. Deployment of a mission at technical level to explore options for cooperation and strenghtening of capacities for border management and the fight against smuggling. Step up work with Mali on the transit dimension, focusing on voluntary return of transiting migrants. Strengthen cooperation on effective return of irregular migrants including of Malians attempting to cross the southern Libyan border irregularly. Maintain close dialogue with Mali as Chair of the Rabat Process. Arrivals of Ethiopian nationals on the Central Mediterranean route reached 3 657 in 2016, while some 30 000 21 Ethiopians are regularly residing in Europe and up to 5 000 new residence permits delivered every year. Ethiopia is also a key country of transit for migrants and refugees from the Horn of Africa, including for Eritrean refugees and asylum seekers – though numbers here are declining, with over 21 000 Eritreans reaching European shores through the Central Mediterranean route in 2016. While the importance of Ethiopia for regional stability is widely recognised, the internal political situation in Ethiopia remains difficult. The ongoing State of Emergency has led to a decrease in violence, and the Government has started engaging with opposition parties. However, it remains to be seen whether this will be sufficient to address the pressures which led to the outburst of violence last October. The EU will continue to engage with all relevant stakeholders to prevent renewed violence, support the necessary political reforms and to facilitate an inclusive dialogue. Since June 2016 EU relations with Ethiopia have been framed by the EU-Ethiopia Strategic Engagement, which includes a sectoral dialogue on migration. Ethiopia has taken an active and constructive role in regional migration management in the follow-up to the 2015 Valletta Summit, notably as Chair of the Khartoum process since December 2016. High level engagement has continued, through a meeting between Commissioner for International Cooperation and Development Mimica with Prime Minister Desalegn in January, a meeting between High Representative/Vice-President Mogherini and the Ethiopian Minister for Foreign Affairs Gabeyehu in the margins of the February 2017 Munich Security Conference, and a visit of Minister Gabeyehu to Brussels, also in February. High Representative/Vice-President Mogherini is scheduled to travel to Ethiopia in March. Ethiopia already benefits from a regional programme to better manage migration, adopted in December 2015 supported under the EU Trust Fund for Africa. It will also benefit from further regional programmes under the Trust Fund adopted in December 2016. These include a Regional Operational Centre for the Khartoum Process, and a Facility to support returns and to help stranded migrants and their sustainable reintegration into communities. Ethiopia remains one of the largest refugee-hosting countries in Africa, with over 790 000 refugees from the region 22 , and has continued to benefit from EU support to these refugees and their host communities through humanitarian funding and the Regional Development and Protection Programme. Further programmes in the pipeline will contribute to tackling the root causes of irregular and forced migration, with a focus on job creation. Notably, support will be provided to Ethiopia's commitment to improve livelihood opportunities for refugees in the country, including by reserving 30 % of 100 000 jobs in two planned industrial parks to refugees. The European Development Fund has also contributed to Ethiopia's efforts to improve migration management, notably through supporting a new decentralised migration management system. While in 2016 the contacts at technical and political level have intensified and a promising dialogue on return and readmission has started under the 2015 Common Agenda on Migration and Mobility, concrete progress remains very slow. In 2016, only 122 Ethiopians irregularly staying in EU countries were returned to Ethiopia. In February 2016, a small number of well-documented return cases were submitted to the Ethiopian authorities as a pilot to test cooperation on migration. Yet to date travel documents have not yet been delivered and returns are stalled. Dealing with these cases has brought to light the negative consequences of having different reintegration packages among EU Member States for returns to the same country. Dates for a proposed workshop on readmission have yet to be confirmed. A European Migration Liaison Officer will be deployed in Ethiopia in March 2017. Finalise actions on the pilot return cases and use them as the blueprint for faster returns to be performed in the future. Continue to support Ethiopia as a country of transit and of destination of migrants and refugees, including through the actions financed under the EU Trust Fund for Africa. Launch the Strategic Engagement sectoral dialogue on migration (target date of April 2017). Maintain close dialogue with Ethiopia as Chair of the Khartoum Process. The Central Mediterranean route has become the dominant route for migrants and refugees to reach Europe. Almost 90 % of the 180 000 detected on the route in 2016 departed from Libya, with smugglers able to exploit the unstable political and economic situation. Finding a lasting solution to Libya's governance and security challenges continues to be a key priority for the European Union, its Member States and international partners. The Joint Communication on "Migration on the Central Mediterranean Route – Managing Flows, Saving Lives" 24 adopted in January proposes a set of concrete operational actions to help address the situation. The success of these actions requires close cooperation with the relevant partners in North Africa and concerted efforts by EU institutions, Member States, as well as cooperation with key partners like the United Nations High Commission for Refugees and the International Organisation for Migration. The proposed actions include: reducing the number of crossings and saving lives at sea, stepping up the fight against smugglers and traffickers, protecting migrants, increasing resettlement and promoting assisted voluntary returns, managing migrant flows through the southern Libyan border and increased cooperation with Egypt, Tunisia and Algeria, including through regional initiatives like the Seahorse Mediterranean network 25 . Some of the proposed actions can only be successfully implemented once the security situation improves. At the Malta Summit, Heads of State or Government adopted the Malta Declaration 26 , which sets out a number of concrete actions to be taken along the route, along the proposals made by the Communication. This is being actively taken forward through an Implementation Plan by the Maltese presidency, in close coordination with the Commission, the High Representative, and the Member States. Support to the management of migration flows in the North African countries located on the Central Mediterranean route is a clear priority. EUR 200 million will be mobilised for projects in 2017, with a priority focus on migration-related projects concerning Libya. Already in 2016, projects have focused on Libya, with the objective of providing protection to most vulnerable migrants and creating socio-economic opportunities at local level. A mission at the start of March will follow up on the Joint Communication and the Implementation Plan of the Malta Declaration. This follows the visit of Prime Minister Serraj to the EU in February. Discussions are under way to focus support on protection at disembarkation points, as well as on humanitarian support to those migrants who are in reception/detention centres, while increasing support for alternatives to detention. The contribution to socio-economic stabilisation in Libya will continue to be addressed, in particular through work at the municipality level. This will add to work to enhance rescue at sea, including training of the Libyan Coast Guard. Operation Sophia and the Seahorse Mediterranean network have both already trained members of the Libyan Coast Guard. Operation Sophia has completed a first package of activities resulting in the training of 93 personnel and has started a second package of specialist training in Malta. Efforts are now being stepped up. A mapping exercise of all ongoing training activities has been undertaken to agree on the establishment of a comprehensive training plan for the Libyan Coast Guard. Specific coordination mechanisms are in place. Immediate action by the Commission includes the expansion of the Seahorse training of the Libyan Coast Guard, with 15 new training courses being planned for the period February-July 2017. This is also complemented by support to migration management under the Regional Development and Protection Programme. Coordination has also been stepped up with several UN organisations, including the United Nations High Commissioner for Refugees, the International Organisation for Migration, the World Health Organisation, the World Food Programme, the United Nations Development Programme, and the United Nations International Children's Fund, to discuss ideas on possible cooperation. As part of the project supported under the EU Trust Fund for Africa, the International Organisation for Migration has been assigned to implement the voluntary return and reintegration of an initial target of 5 000 migrants in Libya. It remains important to swiftly implement this and seek to further expand it, including through providing sustainable reintegration support to an increased number of migrants, in complementarity with actions by Member States. Reintegration support will be provided to returnees across the whole of the area covered by the Trust Fund. A joint initiative has already been signed between the Commission and International Organisation for Migration in December 2016 for migrant protection and reintegration in Africa along the Central Mediterranean migration routes (EUR 100 million). The EU will continue facilitating the work of the International Organisation for Migration, including by fostering cooperation with African partners to accelerate the assisted voluntary returns of migrants stranded in Libya. An increasing number of migrants in Libya are being assisted in this way. 1 113 migrants, mostly from sub-Saharan countries, volunteered to return home in 2015, 2 777 in 2016 and in 2017 so far, return assistance was offered to 744 stranded migrants, with Nigeria and Senegal the most important countries of origin 27 . The most vulnerable returnees were given additional reintegration assistance, which helps in cases like establishing small businesses, pursuing educational opportunities, or seeking treatment for health issues. Strong coordination on the ground will be sought with Member States, in particular with Italy, which has announced its intention to set up an Africa fund of EUR 200 million, part of which will help implement the Italy-Libya Memorandum of Understanding 28 . In the past months there has been a significant decline in the number of migrants headed for Europe embark in Egypt to cross the Mediterranean 29 , Egypt remains a key strategic partner on migration. It is a key geographical crossroads and the Egyptian authorities have been working to prevent irregular access to Libya and to ensure the swift return of its own nationals arriving to the EU through the Central Mediterranean route. Continued and increased engagement with Egypt is key. On the basis of the future Partnership Priorities, concrete and intensified cooperation on migration management will be sought, in particular to support the implementation of national strategies to address the root causes of irregular migration. The engagement will be followed up when the Egyptian Foreign Minister addresses the Foreign Affairs Council in March. Concrete follow-up of a visit at Senior Officials level in January is also under way. The Terms of Reference for a formal EU-Egypt migration dialogue are currently being defined and a first meeting should take place in March/April 2017. Discussions are also under way on projects under the EU Trust Fund for Africa. Intensified cooperation could include supporting cooperation with the authorities to implement national strategies, addressing the root causes of irregular migration through supporting local economic development and through providing access to jobs for migrants and host communities, and increasing protection for the most vulnerable. Other workstrands include an inter-agency visit to the European Border and Coast Guard Agency in Warsaw in March, the nomination of an Egyptian contact point for Operation Sophia, and examining possibilities for information exchange under the Seahorse Mediterranean project. Increasing the capacity of the authorities of the North African countries to tackle irregular migration and trafficking by strengthening their border surveillance systems is key. In this light, Egypt's involvement in the Seahorse Mediterranean project will be of paramount importance. Finally, Egypt has expressed general interest in migration management capacity building, notably to help implement a new anti-smuggling law adopted in October 2016. In February 2017, the Commission extended the geographical scope of the EU Trust Fund for Africa to cover Côte d'Ivoire, Ghana and Guinea 30 . Technical missions to these countries are now being planned to identify their needs in light of possible support. Commissioner Mimica has visited the Gambia in February to meet newly elected President Barrow as a sign of support for the peaceful and democratic change. Discussions in the field of migration will be followed up soon. Asia is one of the major areas of origin of migration to the EU. Security challenges, political instability and poverty all make this likely to continue. Within the framework of the Budapest Process, the Silk Routes Partnership for Migration offers a structured dialogue with the EU, and an action adopted in December 2016 31 aimed at maximising the development potential of migration and mobility within the region and provides a regional response. Afghanistan is a very important country of origin. In 2016, 50 000 Afghans arrived irregularly in Europe, and whilst this represented a major fall from 2015, the share of Afghans remains high. Afghans are now the second-largest group of applicants for international protection in the EU (over 175 000 in 2016), though the proportion of Afghans recognised as needing international protection has fallen 32 . Assisted voluntary returns increased significantly, to almost 6 000 in 2016. Returns from Member States and third countries need to increase to reduce the high number of Afghans still stranded in countries on the Western Balkan route. The Commission is working with the countries concerned, and with the Afghan authorities, to make progress in this area. Cooperation with Afghanistan on return has continued under the Joint Way Forward signed in October 2016, as well as bilateral agreements with Member States. Since December 2016, four return flights have been organised with a total of 75 returnees. The Commission is closely monitoring the implementation of the Joint Way Forward and a second meeting of the Working Group for its implementation will take place at the end of March. The cooperation in the area of irregular migration has been accompanied by help to the long-term reintegration of returning migrants. Afghanistan will be the largest single beneficiary of a regional programme to help reintegration. The EU will support the sustainable reintegration of those Afghan nationals who have returned from Pakistan and Iran to Afghanistan, facilitating access to livelihood support services and social cohesion in host communities, reflecting a regional approach to support the protection and sustainable reintegration of Afghan nationals displaced in their region. Migration is in the forefront of the EU's overall relationship with Pakistan and the effective implementation of the EU-Pakistan Readmission agreement is addressed at the regular Joint Readmission Committees. The latest meeting on 28 February took stock of the difficulties experienced by Member States in readmission and agreed to set up an electronic platform aimed at reducing problems in processing readmission applications, which will start working after approval by the Pakistani authorities. A European Migration Liaison Officer will be posted in the EU Delegation in Islamabad in March. Closer operational cooperation is also under way with the Government of Pakistan on countering migrant smuggling. This will include a visit to EU Agencies, with the aim to enhance exchange of information and intelligence, better support operational investigations and better understand regional risks and threats. In 2016 additional funds were promptly mobilised to respond to the sudden increase in returns from Pakistan and new measures are under preparation to ensure sustainable reintegration, access to livelihood support services and social cohesion in host communities in the region. A call for proposals for projects along the silk route aimed at enhancing law enforcement capability and capacity in Afghanistan and Pakistan closed in February. The successful project bid will enhance the ability to investigate, prosecute and dismantle organised crime and migrant smuggling networks. On Bangladesh, the EU political engagement and the agreed follow-up to the migration dialogue of April 2016 has not yet brought progress on returns. The Bangladeshi authorities have not proved ready to discuss Standard Operating Procedures. Discussions on a new approach and the need to anchor cooperation on migration as part of broader cooperation involving other policy areas such as security, education, development assistance and trade are under way, also with Member States. Recent diplomatic consultations will be followed up with a joint mission of EU and Member States planned for March, specifically to discuss return and reintegration. An awareness raising campaign on the dangers of irregular migration was launched at the beginning of 2017, while reintegration projects are being developed. The engagement of Iran in a comprehensive migration dialogue as a key element of the overall EU-Iran relations, agreed in the April 2016 Joint Statement between High Representative/Vice-President Mogherini and Iranian Foreign Minister Zarif, has been put in motion with an EU technical mission in February, preparing the ground for the a comprehensive migration dialogue at the political level. The EU and Iran have started mapping out areas of common interest in relation to migration management with a view to holding annual exchanges on these issues. Key areas include the legal and institutional framework, the knowledge base, legal channels of migration, border management, prevention of irregular migration, protection, and the regional dimension. In addition, the EU will also continue to support Iran's long-standing efforts to integrate Afghan refugees. Iran continues to host a displaced population of around 3 million migrants. EU assistance to humanitarian partners complements the Iranian government's own efforts to assist vulnerable refugees and to ensure their access to basic services. The step change needed in the effectiveness of return inside the EU needs to be matched with work with third country partners. So far, based on the data provided by the EU Member States, there has been no or only limited improvement in return rates for the five priority countries. The renewed Action Plan on return proposes a number of concrete actions to ensure that those not entitled to international protection are identified and ready to be returned swiftly, that procedures are effective, thus closing loopholes in the system 33 . It contains concrete measures to substantially improve return rates also in the short term. Some of these measures can be taken at Member State level (for example increasing awareness about the possibility of assisted voluntary return and reintegration), others require close cooperation at EU level (for example aligning the level of assistance offered to facilitate returnees' integration; better operational cooperation among Member States, including through electronic tools; increased funding). The European Border and Coast Guard Agency is expected to play an increasingly important role in this. Engaging with third countries through the Partnership Framework, using all available policies and tools 34 , will foster better cooperation with a view to identifying, re-documenting and readmitting their nationals. Overall, tailor-made approaches should be used to identify all the interests, incentives and leverages at stake with a partner country in order to achieve targets and commitments and to offer specific support measures by the EU and interested Member States to the partner country concerned, so as to ensure a better management of migration, and in that context to further improve cooperation on return and readmission. The EU and Member States will need to employ their collective leverage in a coordinated and effective manner to achieve this result. Other policy tools have been harnessed in support of the Partnership Framework. To take advantage of the preferential trade arrangements agreed for Lebanon, the first companies to benefit from simplified rules of origin requirements for Jordanian exports to the EU – which provide job opportunities to Syrian refugees alongside Jordanians – were selected in January 2017. For students and researchers, by the end of 2016, the Erasmus+ and Marie Sklodowska Curie programmes had been scaled up to offer 8 000 mobility actions for students and 560 for researchers. This has also been complemented by Member States' scholarships. The opportunities for mobility will be part of the dialogues under the Partnership Framework. Research and innovation can also provide concrete opportunities and actions to support the Partnership Framework, such as PRIMA, the Partnership on Research and Innovation in the Mediterranean Area, that addresses root causes of migration by developing innovative solutions for sustainable agriculture and water management. A step further will be to bring legal migration fully into the Partnership Framework increasing the impact of legal migration instruments and helping to reduce the resort to irregular channels. Action will be taken in this area, particularly the establishment of possible "EU-wide offers" on legal migration vis-à-vis key third countries, as well as in the area of visa. This will be carried out through close and constructive cooperation between the Member States and the Commission. The expertise of EU Agencies, notably the European Border and Coast Guard Agency and Europol, is being used to provide more targeted support for risk analysis and for investigating the criminal networks behind migrant smuggling. This is leading to concrete results in the work with new partners such as Nigeria and Pakistan, replicating successful initiatives under way in Africa, Western Balkans, Turkey and the Eastern Neighbourhood countries. To step up their role on the external dimension Eurojust has recently invited Niger and Senegal to appoint judicial contact points within their Ministries of Justice or Prosecution Offices and will follow up with the other priority countries. By mid-March, eleven European Migration Liaison Officers will have been deployed to priority third countries of origin and transit 35 . This is an excellent example of cooperation between the EU and the Member States, and will provide a focal point for the full range of potential migration-related issues. The EU is using a range of financing instruments to support the implementation of the Partnership Framework. The most prominent remains the EU Trust Fund for Africa. The Trust Fund operates in a total of 26 countries, with the recent extension to Ghana, Guinea and Cote d'Ivoire 36 . It has opened the door to a new depth in cooperation by creating further incentives for cooperation in key areas of interest. Resources currently allocated to the EU Trust Fund for Africa amount to more than EUR 2.5 billion, including EUR 2.4 billion from the European Development Fund and several EU budget financing instruments, and EUR 152 million pledged so far by EU Member States and other donors (Switzerland and Norway). Nevertheless, operational delivery under the EU Trust Fund should be accelerated, and Member States and partners should ensure that procedural issues do not stand in the way of operational results. Most recently, a total of 42 new programmes worth EUR 587 million were agreed in December 2016 37 . This brought the total number to 106 adopted projects worth over EUR 1.5 billion. Programmes contracted so far amount to EUR 627 million. Programmes should increasingly focus on migration-specific projects and be linked to results. In the Joint Communication on the Central Mediterranean 38 , the Commission committed to make available EUR 200 million for Trust Fund actions in North Africa in 2017, with a priority focus on migration-related projects concerning Libya. The Communication also invited Member States to match this EU contribution, to allow to expand the scale of the interventions and maximise impact on the ground. Other funding instruments also continue to contribute to migration. In December 2016, several projects for a total amount of EUR 15 million were launched under the Development Cooperation Instrument, with the aim of contributing to the implementation of the Rabat process. The majority of the projects will be implemented by civil society organisations in areas such as migrant children protection, trafficking in human beings, diaspora, remittances and migrants' rights. The implementation of the Partnership Framework also benefits from tools such as Macro-Financial Assistance 39 . In addition, the Commission proposed in September 2016 the External Investment Plan including the European Fund for Sustainable Development. This will boost investments and job creation in partner countries. The December European Council underlined the need for swift adoption of the relevant legislation. It is of particular importance to adopt this in the first half of 2017. Given the potential contribution to the EU and Member States’ work on migration, it is of capital importance that the co-legislators adopt the legislation as soon as possible so that the Plan can become operational soon. International Financial Institutions, including the European Investment Bank, European Bank for Reconstruction and Development, the World Bank Group, the Council of Europe Development Bank and the International Monetary Fund have all been preparing initiatives in support of refugees 40 . The Commission has played an important coordinating role to ensure complementarity between these initiatives. Sustained work under the Partnership Framework has continued over the past months as set out by the European Council in December. The geographical scope of the initiatives has broadened, packages are better tailored to our partners while more policies and tools are being harnessed to this work. However much remains to achieve, notably in further reducing hazardous journeys to Europe and in increasing returns. In the coming months all players should step up efforts to take forward the work under the Partnership Framework, as well as the new initiatives in the context of the Malta Declaration. Synergies will be in particular developed in the Sahel belt and the southern side of the Libyan border, as well as to facilitate the swift Assisted Voluntary Return of migrants stranded in Libya. The Valletta Senior Official Meeting of 8-9 February also confirmed the link between the Partnership Framework and the Valletta Action plan. It is clear however that while cooperation has increased in a true spirit of partnership, there is a need to accelerate operational delivery. In addition, negotiations on the European Fund for Sustainable Development should be concluded by adoption in the first half of 2017, to allow the Fund to become operational as soon as possible. The June report on the Partnership Framework will be an opportunity to take stock, one year on from its launch. This report already demonstrates the multi-faceted and inter-linked nature of the efforts being made at all levels in order to address migration in a sustainable manner and in a spirit of partnership. It is essential that all strands of activity continue to run in parallel, with clear priorities set, and with the contribution of all to the shared objective of better management of migration. Communication on establishing a new Partnership Framework with third countries under the European Agenda on Migration, COM(2016) 385 final of 7.6.2016. Unless indicated otherwise, numbers of arrivals of migrants to Europe are based on data from the European Border and Coast Guard Agency; data on returns for 2015 are based on Eurostat statistics and for 2016 on the results so far from a dedicated data call to Member States which was done in January/February 2017. JOIN (2017) 4 final. Joint Communication to the European Parliament, the European Council and the Council: "Migration on the Central Mediterranean route – Managing flows, saving lives". The 5 pillars of the Joint Valletta Action Plan are: Development benefits of migration and addressing root causes of irregular migration and forced displacement; Legal migration and mobility; Protection and asylum; Prevention of and fight against irregular migration, migrant smuggling and trafficking in human beings; and Return, readmission and reintegration. Follow up of the Valletta Summit on migration of November 2015. COM(2017) 200 and C(2017) 1600 of 02.03.2017 respectively. Source: International Organisation for Migration, http://www.globaldtm.info/dtm-niger-flow-monitoring-report-january-2017/. International Organisation for Migration Niger overview, January 2017. Those helped were 70% male and 30% female. Commission Decision C(2015) 7293 final; The EU emergency Trust Fund for stability and addressing root causes of irregular migration and displaced persons in Africa (the EU Trust Fund for Africa). The G5 Sahel countries are Burkina Faso, Chad, Mali, Mauritania, Niger. Europol, Situation report (February 2016): Trafficking in Human Beings in the European Union. The Fonds d'Appui à l'Investissement des Sénégalais de l'Extérieur financed 170 projects in 2016, for a total of EUR 1.3 million. The four projects approved in December amount to EUR 89 million, the total amount for the nine projects from which Senegal can benefit is EUR 161.8 million. This is based on partial data, notably excluding Germany which could alter the trend. The three projects adopted in December amount to EUR 61 million, out of a total of nine projects worth EUR 151.6 million. More than 42 000 in Mauritania, 60 000 in Niger, and 32 000 in Burkina Faso. Source: United Nations High Commission for Refugees. Source: Eurostat, Figures for 2015. Source: United Nations High Commission for Refugees, December 2016. The designations employed and the presentation of material on this map do not imply the expression of any opinion whatsoever concerning the legal status of any country, territory, city or area or of its authorities, or concerning the delimitation of its frontiers or boundaries. JOIN (2017) 4 final of 25.1.2017. A regional network for the exchange of information and cooperation on irregular migration and cross-border crime between points of contact in North African countries and Member States in the Mediterranean region. Source: International Organisation for Migration. Signed on 2 February 2017 between Prime Minister Gentiloni and the Chairman on the Libyan Presidential Council al-Serraj. From mid-2016, there has been a dramatic decline in the number of irregular migrants registered as arriving in the EU from Egypt. Only three persons have been recorded since the start of 2017. Commission Decision C(2017)772 of 08.02.2017 modifying Commission Decision C(2015)7293 of 20.10.2015 on the establishment of a European Union Emergency Trust Fund for Stability and addressing root causes of irregular migration and displaced persons in Africa. Funded under the Development Cooperation Instrument. The recognition rate of Afghan applicants has decreased continually between September 2015 (68 %) and December 2016 (33%). No conditionality can be attached to needs-based humanitarian aid in line with the humanitarian principles. Ethiopia, Jordan, Lebanon, Niger, Nigeria, Pakistan, Senegal, Serbia, Sudan, Tunisia, Turkey; Liaison Officers to Mali and Egypt to be deployed in next months. 28 programmes under the Sahel/Lake Chad window (EUR 381 million); 11 programmes under the Horn of Africa window (EUR 169.5 million) and 3 programmes under the North of Africa window (EUR 37 million). JOIN(2017) 4 final of 25.1.2017. Macro-Financial Assistance is available to European Neighbourhood Policy countries that are experiencing a balance-of-payments crisis and helps covering acute external financing needs of the beneficiary country, hence strengthening its foreign exchange reserves. It also contributes – through targeted conditionality – to macroeconomic stabilisation by supporting the structural reform agenda of the beneficiary country. Programmes have assisted Tunisia and Jordan. In areas such as reception infrastructure, support to SMEs and micro-enterprises, addressing root causes. Flow of irregular migrants transiting the country further reduced. Effective action against smuggling in Agadez region continued (seizure of equipment and arrest of smugglers). Medium term Action Plan being drafted, to address gaps in the current approach. Support for enforcement of anti-migrant smuggling legislation. EU Migration Liaison Officer deployed to the EU Delegation in Niamey on 1 February. Meeting of the Africa-Frontex Intelligence Community held at the start of March. New projects adopted under the EU Trust Fund for Africa in December 2016, to assist migrants, facilitate return and raise awareness, provide land, accommodation and access to drinkable water, and create jobs. Contract signed with the High Authority for Consolidation for Peace to provide short term employment opportunities for youth in the Agadez region. Field missions conducted to assess alternative routes and identify projects to create economic alternatives in local communities. Support provided to the G5 Sahel. Launch of Cooperation Platform on Migrant Smuggling, involving EU Agencies and Member States. European Migration Liaison Officer has been deployed since 1 February. Projects adopted under the EU Trust Fund for Africa in December 2016 to support reintegration, literacy, and mental health services. Support to cover humanitarian needs of the victims of the crisis in Nigeria, in terms of food and nutrition, protection, water, sanitation and hygiene, shelter, non-food items, and health. Bilateral cooperation with Italy, through sensitisation mission in December. Focal Points for Identification identified in relevant ministries. Negotiations with the European Border and Coast Guard Agency on improved working arrangements launched. Four projects under the EU Trust Fund for Africa adopted in December 2016, to support reintegration, job creation, and a biometric national registry system. Senegal benefits from the regional project supporting the internal security services of six Sahel countries. Meeting between High Representative/Vice-President Mogherini and Minister for Malians Abroad Sylla (February). Development of National Border Strategy and a related Action Plan. Capacity building of the police forces in charge of border management. Stepping up migration dimension of the Common Security and Defence Policy (CSDP) mission operating in Mali. Projects adopted under the EU Trust Fund for Africa in December 2016 to improve biometric population registry, support reintegration of returnees and youth employment. Step up work with Mali on the transit dimension, focusing on voluntary return of transiting migrants..
Regional programmes under the EU Trust Fund for Africa adopted in December 2016, to support a Regional Operational Centre for the Khartoum Process, and a facility to support returns, to help stranded migrants and their sustainable reintegration into communities. Support to refugees hosted in Ethiopia and their host communities through humanitarian funding and the Regional Development and Protection Programme. European Migration Liaison Officer to be deployed in Ethiopia in March 2017.